Hi Ndifreke, or Freky as many know you by. Could you tell us a little bit about yourself?My Name is Ndifreke Andrew-Essien everyone calls me Freky. I come from Akwa Ibom State in Nigeria. By the grace of God I am the Founder and Executive Director of Freky Andrew-Essien Care Foundation, well known as FAECARE Foundation and it is a non-profit organization that works with vulnerable groups (Persons with disability, vulnerable children, youth and less privileged in society).I also work with FGBMFI South-South Regional Office as the South-South Regional Office Manager. On the side, I plan events; weddings, concerts etc. I am a Disability Rights advocate, social entrepreneur, speaker, and coach and music minister…don’t worry it’s not that much. My goal is to leave a legacy and affect generation(s), by adding a little extra (passion, focus, creativity) to the ordinary to make it extraordinary. I have Bachelors and Masters degrees in Human Physiology and am currently working on a second Masters in Public Health. Most important, I am the daughter of the King of Kings!!! What circumstances led to you being in a wheelchair? How long has it been?The year 2002 had been a very pleasant one. I was at a very good place in my life; I was doing well in school being a medical student. On the fateful day - 26th of December, 2002, it all changed in the blink of an eye: One minute I was on the bike across from my destination, contemplating whether to visit a friend first or go directly to my original stop, and the next minute, I had landed on my back on the hard tarred road in such horrendous pain wondering where my legs where, as I couldn’t feel them. I am still not sure what happened or what hit us. All I know is that I was involved in an accident where I sustained a burst fracture leading to spinal cord injury at T6-T7 and needing a wheel chair for mobility after a series of surgeries and a long road of recovery and self-rehabilitation. 2002 to 2017…15 years ago… like play like play. What are some of the things or stereotypes you've heard surrounding disability in Nigeria? What haven’t I heard…and some of it is said out of ‘so-called love o.’ Let’s see…the best way to describe the Nigerian setting when it comes to disability is this - In the midst of a lot of sympathy and pity we find a lot of negativity, being looked down on and told what we can and cannot do based on their own opinion and without your input whatsoever. Basically the attitude of Nigerians generally with regards to disability needs a paradigm shift. What are some of the daily challenges you face, and how do you get around them? For instance, while I was back home, sometimes I would wonder about how someone in a wheelchair would get into majority of the buildings without someone physically supporting them.My dear I think it may have been written in some Nigerian architectural book that if you do not have stairs leading to every room in your home, office, business and even hospitals that your building is not beautiful…Naija can like steps! It's an accessibility nightmare. 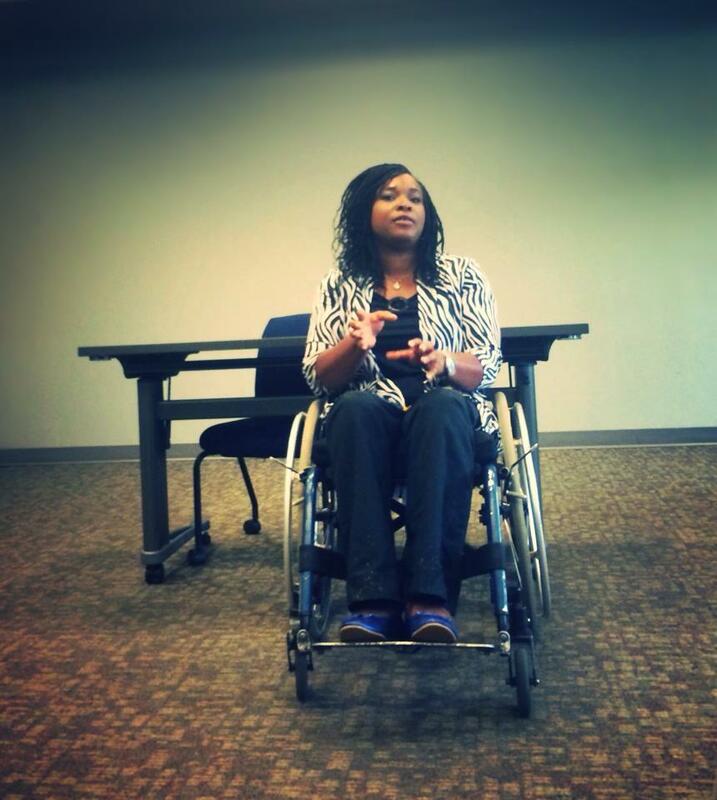 I have personally resolved to turn every step into a podium to educate and push awareness on accessibility. Initially I used to get upset and really frustrated about it but now not really. There are so many stories to tell. I remember once at a summit, a bank staff approached me and tried to get me interested in their bank offers. After a nice conversation I asked a very simple question - “How do I get into your bank to access these services?” Haha, you should have seen the power of realization... she stuttered and stuttered and I just had to have mercy and tell her she should not feel so mortified. I advised her to give my feedback to management and tell them their banks inaccessibility was blocking off a viable target market. Every day is a challenge but I wake with a winner’s attitude ready to take it on with the help of God. Tell me more about your foundation and how anyone can help.FAECARE Foundation is an NGO, founded in 2013, that works with vulnerable groups: Persons with disability, vulnerable children, youth and less privileged in communities and society. Our achievements as an organization are centered on projects that we implement with respect to our target groups and thematic areas. Under our OVC program we have an annual children’s charity concert tagged PURPLE which in a nutshell is a program that celebrates the child irrespective of status and provides a platform for expression of talents. We have successfully done 4 editions of this program and gearing up for the 5th edition come 3rd June. We are particularly excited about how far we have come and will be marking the event with a magazine to promote literacy. Still under our OVC program we have the FAECARE Education Support Fund which offers partial scholarships to vulnerable children enrolled in our OVC program who are out of school. We have other programs under this program area but let me speak about our program targeted at Persons with disability specifically the woman/girl living with disability. Its tagged Hope Again Initiative and it is a community based vocational skills co-mentoring program. It’s very exciting for us. We also engage in a lot of media advocacy with respect to disability related issues. For the youth we create a space and an opportunity for volunteering at our programs and projects we also run an in-school youth program “Project SMART” where I personally speak. I can’t fail to mention our health program “Reach our community Project” which is our free medical and welfare program. In a nutshell it is centered on our target vulnerable groups and focused on our thematic areas, these are some of what we do as an organization. More details can be viewed on our website and Facebook page. YES we need all the help we can get, in fact if you ask any organization today the need the response will be “FUNDS” money matter, but on a serious note we welcome friends , partners and sponsors in cash or in kind nothing Is too small and for us no partnership is unserviceable. You can be a wealth of resources or can link us to key support like commodities, mobility aids, books, funding partners, cooperates and individuals or choose to be a monthly, quarterly or project based financial partner or maybe you just want to volunteer… we welcome all friends of FAECARE. What are some of your favorite activities that you enjoy? I love singing…I particularly love finding the harmony in songs, I also love reading and if travelling was cheaper that would be a great hobby too. What would you say to encourage others who have to live with disabilities? And to those who surround them - caregivers, family members, friends, etc? There are many messages but the one I'd stick with for this interview is this. Life will throw you a curve or two, but in the end it is not necessarily about those challenges but what you do and how you react to the curves and challenges. The fact that you are alive and still here counts for more than you believe it does, our scars tell the story that we have seen, experienced and have overcome. There is ability in disability so avoid using it as a crutch rather, please see it as a stepping stone to greatness. To caregivers and families I would like to say we appreciate you and know it is not easy do find support especially other parents and care givers who know what you are going through and build a support , do not spoil your disabled child with over protectiveness, I promise he/she will not break and can do a lot. teach them to be fearless and always push the status quo…one more thing if you need help, please ask. Finally, who are some of the people who inspire you to keep going and why? God is my ROCK. I stay inspired by God and my passion for meaningful and impactful living. My parents are awesome and my family is amazing. I am inspired by people like Michelle Obama and meeting her was amazing, Joan Erickson-Tada is also an inspiration having lived a full life despite disability. There are so many others I tend to take from everyone in my life even children. Wait! You met Michelle Obama?!?!?!? How did that happen? Yes I participated in the Mandela Washington Fellowship program (2014 cohort). It was an amazing experience of learning, mentoring, leadership, and networking opportunities. I spent six weeks at the University of Delaware, where we had academic sessions, volunteering opportunities and great interactions. After six weeks in the university, we had the chance to be in a town hall meeting with President Barack Obama - it was exhilarating and definitely an amazing experience. The separate town hall meeting with President Obama and Michelle Obama was loaded with insights and profound quotes and statements. The private FLOTUS 40 discussion with Mrs. Obama on girls’ education was empowering and a great motivator. And all the sessions with ambassadors, senators, CEOs, etc., and side events were really good. It felt amazing and meeting the first lady of the United States - Michele Obama was the icing on the cake. Her passion for girls education and the girl child is truly inspiring and definitely rubbed off on me. Thanks so much to Freky for granting this interview, and showing that disability doesn't mean a life of mediocrity. She, along with others, are trailblazers in Nigeria in advocating for people living with disabilities. I'm definitely inspired by Ndifreke and am committing to find a way to help out with her foundation. Don't forget to check out the website and Facebook page, and see how you can help too. This is so Inspiring! God bless her....I usually don't like to address people with disabilities with the fact that they're disabled, I just treat them like normal people...God bless her bigbig! Me either, because it seems like I'm subconsciously limiting them. But I love her spirit and everything she's doing. Love this! Nigeria is so behind when it comes to being sensitive you disabilities. Truly inspiring piece! Strong woman doing great things, God bless her heart! I hope to see improvements in Nigeria's approach to disability. Even if it's with buildings, banks having good mobility access for the wheelchairs.... one step at a time! So people on the chairs can move around easily! Architects doing new designs and renovations can play their part, by considering these in designs! The major problem is that a lot of people don't start to think about these things unless it happens to someone they know. I do hope they change for the better sha. wow its been a while sisnce I've been on this here blog. this was a very lovely post. The work she does is very important and inspirational hey. You don't find cool posts that speak to the heart and celebrate people who do work on matters of importance on blogs anymore. Thanks for this . Thanks! Nice to see you here again. I have others in mind for upcoming interviews and I hope I can keep up. I enjoyed reading this, Freky is indeed an inspiration and everyone can learn a thing or two from this interview. I like this series Berry and look forward to more.